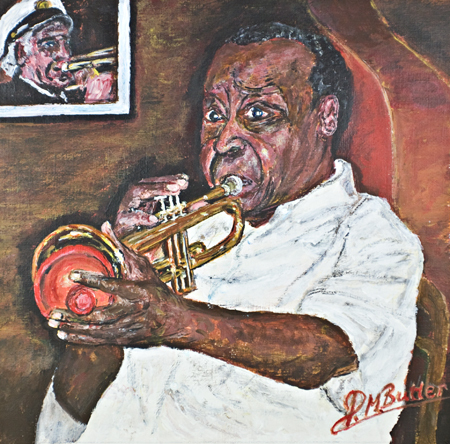 Legendary music man Dave Bartholomew was just 89 years young when I captured this acrylic portrait of him on trumpet in The Palm Court Jazz Cafe. Now he is 95! Sheer good fortune took me to Decatur Street that day in April, 2010. One of New Orleans’ greatest stars, Dave wrote “Let the Good Times Roll” and with Fats Domino went on to write unforgettable numbers like “Ain’t that a Shame” and “Blueberry Hill”. In all he has written over 4,000 songs including “One Night” for Elvis Presley.